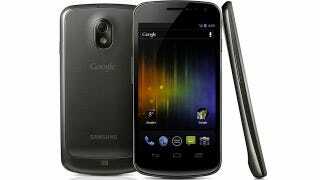 The Galaxy Nexus, the new Android flagship phone from Google and Samsung is finally out of the bag. I am like, omega-level excited about that screen, and Ice Cream Sandwich looks tasty, too. Let's take a bite. Update: Hands on below. The Galaxy Nexus has an NFC radio, which will play a critical role in the upcoming mobile payments revolution (which may or may not change the way we pay for everything). It has a barometer for... well, who know's why, but it has a freakin' barometer and I want to see what developers do with it! Gyroscopes and accelerometers and GPS as you'd expect. It will have LTE radios in certain markets/countries and HSPA+ in others, meaning you should get speedy internets no matter where you live (provided you have coverage). It's also packing a 1.2GHz dual-core OMAP processor from Texas Instruments (a first for Samsung) and 1GB of RAM. The camera and its app both look good. In the native app you can shoot panoramas and time-lapse videos, and even apply "hipster filters." (Subtle guys.) You can also apply video-filters (fun, face-warping stuff) in realtime while video chatting. The phone has an instant shutter (like the iPhone 4S), and you can shoot video at 1080p. It's just a 5MP sensor vs. the iPhone 4S's and the myTouch Slide 4G's 8MP, so we'll have to see how it measures up in real world testing. The phone and its screen look great, but Ice Cream Sandwich is the real star of the show here. You can read our full report on it here, and you can see some of the tastier bits in this Galaxy Nexus video from Google. So, what do you think? Did Apple leave the door open, and did Android step on in? We'll find out when we get some real time with it. We know it'll be available in November, and the rumors suggest it'll be on Verizon for $299. The most noticeable thing about the Galaxy Nexus upfront is that it's something is missing: the buttons. There's basically nothing left besides the screen itself. Just the volume and power buttons on the side. This is it, guys. The phone is sleek, coming in at barely 9mm. It's thin. Maybe too thin. It's light, and while it doesn't feel fragile, it doesn't feel as solid as I'd like a phone to feel. (Not that I want to be carrying around a brick, but heft isn't simply useless weight.) And we don't need to tell you how massive it is again—4.65 inches—but the superthin bezel makes it seem even more gargantuan. On the other hand, it's still possibly going to feel less than comfortable for people with smaller hands. I guess the point is, while it's got a nice textured back, I don't quite love the ergonomics. The screen is a beautiful killer, though, thanks to the combination of pixel density and Super AMOLED's super rich colors. The device is certainly responsive, thanks to its snappy dual-core 1.2 GHz processor—it's more than equipped to handle Ice Cream Sandwich, the star of the show. Using it, I barely noticed the absence of any dedicated buttons. Most users familiar with Android will find Ice Cream Sandwich to have a very short learning curve, even though the interface has been revamped—refined in our opinion. The best part about the new software—aside from face control, voice dictation and all that jazz—is the ability to switch between running apps and the ability to actually kill them quickly, something that was heavily missing in Gingerbread. There's also a segregated widgets and apps menu, which allows you to quickly manage things on the home screen. Oddly enough, though, we couldn't find the Mail app like before—just Gmail—so if you're using a different service, you may be out of luck. The camera app is substantially improved. There really is no shutter lag, although that doesn't always mean you'll get the most pristine pictures. (This is actually something that I suspect hinges more on the Nexus' image sensor.) Panorama mode works effortlessly; one plus for Android. Browsing is a good experience too. Though it's pretty straightforward, the best feature of Android's updated browser is having the option to easily switch between mobile and desktop view. Ice Cream is potentially amazing, basically. I just wish I could hold it in my hands a little bit better than I can on the Galaxy Nexus. You can keep up with Erica Ho, the co-author of this post, on Twitter or Google+. You can keep up with Brent Rose, the co-author of this post, on Google+ or Twitter.